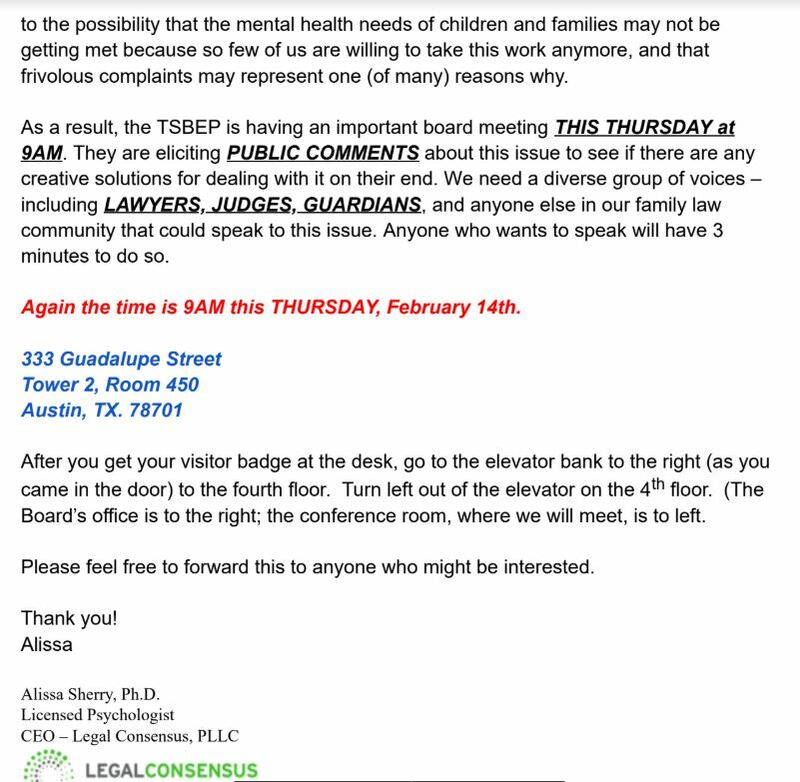 As a follow up to the TSBEP Board meeting on February 14, 2019, we the undersigned to this petition wish to reiterate our grave concerns about one of the TSBEP licensees, Dr. Alissa Sherry (Lic 32248), who conducted deeply-flawed forensic custody and psychological evaluations for family courts which irreparably harmed our children, our families, and us personally. We are saddened that we must take these actions today, but in doing so, we hope to prevent this tragedy from happening to other members of the public who are court-ordered to obtain evaluations. We urge you to take this petition and our individual complaints about Dr. Alissa Sherry seriously and investigate her actions thoroughly. As a critical component of the family law system, we ask that this Board consider taking the actions below, among others, to remedy troubling issues pertaining to misconduct in forensic evaluations and implement long-overdue reform. It is incumbent upon the Board to uphold its professional integrity by strengthening its policies pertaining to forensic evaluations conducted by its licensees, and enforcing those rules rigorously by identifying and disciplining unethical practitioners. Thus, we ask that the board instill more oversight and provide more direction to forensic psychologists involved in family court cases. Taking these and other steps will prevent needless devastation to Texas children and their families. It will also better inform the court as to the best interests of the children, which is the clear mandate in these cases. To not address this important issue would be negligent; it may place the public, especially one of its most vulnerable populations – children – at further risk of irreparable damage and may further erode the public’s faith in the psychological profession. As a result of the damaging effects that Dr. Sherry’s misconduct had on our and our children’s lives, we request that the Board conduct a comprehensive review of its policies and rules regarding forensic evaluations. Due to the critical and extensive nature of the problems discussed herein, we request that the Board create a committee to conduct such a review, and have among its members at least two (2) parents to represent the public’s perspective. that you require Dr. Sherry to undergo a physical and mental evaluation due to a reasonable suspicion of impairment per Texas Occupations Code Section 501.158 Competency Requirements. In conjunction with its own investigations, this action will inform the Board as to this licensee’s competency and further, prevent this potentially impaired practitioner from putting other clients at risk of harm. Until a proper investigation can be completed, we request that the Board suspend forensic evaluations conducted by Dr. Alissa Sherry altogether from the Texas family law courts. Provide and enforce a strict requirement that opinions and statements be validated methodically and scientifically. Require evaluators to clearly identify information that was not substantiated and rationale for not doing so. Establish and enforce rigorous rules when diagnosing individuals for forensic family law cases. Require and enforce evaluators to spend equal amounts of time with parents (as well as their attorneys) and children (including time spent independent of parents). Set and enforce stringent guidelines about collateral informants regarding their reliability and objectivity, including but not limited to, requiring all informants to sign affidavits certifying the truth, completeness, and accuracy of information attributed to them in the final evaluation. Prohibit an evaluator from recommending the dismissal of other professionals. Prohibit and enforce all psychologists from ex parte communications. Set and enforce limitations on time allowed for forensic evaluations, both psychological and custody. Set and enforce fees and costs associated with, including a maximum cost, for forensic evaluations, both psychological and custody. Conduct regular audits of forensic psychologists, including but not limited to, their methodology, conduct, and reports. Provide a clearly defined process for review and authentication of the evaluation report prior to finalizing, including corrections, and include such in the final report. Require all communications between evaluator, attorneys, and all parties are via email and made available to all parties involved. Any telephone conversations should be recorded. Enforce evaluators adhering to the court-ordered scope of services. Require all forensic evaluators to be proficient in and employ trauma-informed methods. We make these requests as parents or families who were harmed by the unethical conduct and malpractice of Dr. Alissa Sherry. Please recognize that we, the undersigned, may represent only a fraction of families negatively impacted by Dr. Sherry. Due to fear of retaliation, legal advice, and pending litigation, others may not have come forward as of this date. In reality, once a family is court-ordered to obtain a psychological evaluation, there is little recourse to do otherwise. Though all of our stories are different, there are unignorable similarities and patterns in our forensic evaluations performed by Dr. Sherry. In an attempt to counter the harm of these deeply-flawed evaluations, some of us obtained peer reviews of Dr. Sherry’s evaluations. These practitioners also identified a disturbing pattern of misconduct. Misdiagnoses after no significant contact with the client; with no client history of psychological issues; and which contradicted other professionals’ opinions. Dr. Sherry regularly diagnoses psychosis in a statistically impossible percentage of divorced parents as compared to the percentage in the general public. As you can imagine, these evaluations took a significant, damaging toll on our children, families, and us in many respects, including psychological, legal and financial. Dr. Sherry’s evaluations of us resulted in these and other harmful effects. Financial hardship and even ruin … cumulatively, millions of dollars in direct expenses for Dr. Sherry’s evaluations, expenses for litigation relating to the evaluations, and expenses for second opinions and peer reviews of the evaluations. Currently, our average cost of just the custody evaluation alone is $61,356 per person and the average spent on litigation and direct court expenses recovering from these false evaluations is $475,875 per person. Many of us have had to sell our homes and/or experienced homelessness. Vulnerability and injustice in litigation. Misdiagnoses and misleading findings are seized upon and exploited by opposing counsel in proceedings. 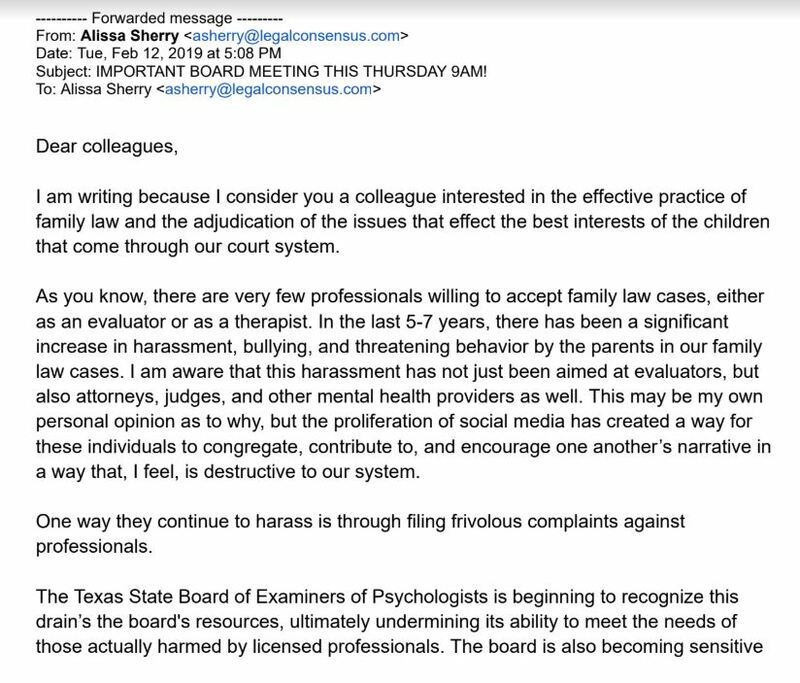 Dr. Sherry’s evaluations represent a form of harassment, not to mention potential malpractice. In closing, in the coming months, we will be filing individual complaints and again, we urge the Board to take these licensing complaints, and others like ours, very seriously. It would be extremely negligent of the Board to dismiss complaints against psychologists who are involved in family court cases. It would give unethical psychologists unabated opportunity to continue causing irreparable damage to Texas children and families. At your earliest convenience, please let us know what, if any, actions the Board will take as a result of the public comments from its February 14, 2019 meeting, this petition, complaints, etc. Dr. Alissa Sherry – Email soliciting support at TSBEP board meeting. http://family-court-corruption.com/wp-content/uploads/2018/06/800px_COLOURBOX7350498-300x151.jpg 0 0 admin http://family-court-corruption.com/wp-content/uploads/2018/06/800px_COLOURBOX7350498-300x151.jpg admin2019-02-12 23:48:262019-02-18 21:19:06Dr. Alissa Sherry - Email soliciting support at TSBEP board meeting. 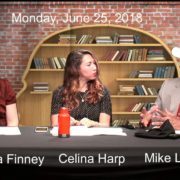 Let me first start off with saying that all of the following comments are my own opinions of Dr. Alissa Sherry: She is the worst psychologist that I have ever come across in my life and should have her ability to practice any type of psychological evaluations severely limited or revoked altogether. In my opinion it borderlines on malpractice at its highest level. Never ever allow her to evaluate you or someone you love no matter who appoints her, fight it to your death as she has the potential to destroy lives by her unprofessional assessments that seemed to be motivated by nothing more than money. This person could be your worst nightmare just look at the other reviews before this one, all rate her at the lowest level possible and basically say the same thing. Has an evaluation been court ordered of you for some reason? In my opinion, you will be risking everything by allowing her involvement with your case in any way shape or form. Go to your attorney, go to the court, go to anyone who will listen and do everything in your power to not allow her anywhere near yourself or a loved one. I personally would not even show up if ordered to. Do not take a chance with Alissa Sherry if you value your children, your marriage, your freedom, your life. Read the other reviews their not wrong in my opinion, proceed with caution and consider yourself warned…..
Dr. Sherry is not interested in your family or their welfare, only in making money in the divorce industry. Will not take both sides into consideration, is unfair and biased. Pitifully overpriced and underperforming. http://family-court-corruption.com/wp-content/uploads/2018/06/800px_COLOURBOX7350498-300x151.jpg 0 0 admin http://family-court-corruption.com/wp-content/uploads/2018/06/800px_COLOURBOX7350498-300x151.jpg admin2018-09-13 05:50:472019-02-18 20:59:14Terrible! This woman is a danger to good parents trying to raise their children in a Christian home. She never met me or my children and only looked at “evidence” provided by my ex-husband. She said what she was paid to say: that I am an alienator. http://family-court-corruption.com/wp-content/uploads/2018/06/800px_COLOURBOX7350498-300x151.jpg 0 0 admin http://family-court-corruption.com/wp-content/uploads/2018/06/800px_COLOURBOX7350498-300x151.jpg admin2018-04-16 05:54:212019-02-18 20:59:15Beware! The ratings on all the sites speak for themselves! She is a danger to children and the family unit. Following what ever the Guardian ad litems suggest to them. Never interviewing the children or using collateral sources including other professionals involved. A total whitewash bias job. Also a fabricator and liar.